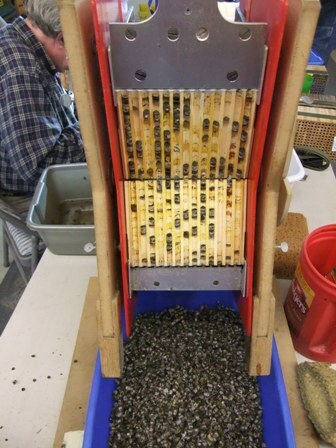 We returned to Sturm Berry Farm last Saturday, November 20, to clean the Binderboard and see how the Osmia aglaia fared this past season. 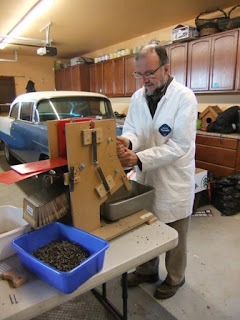 Jerry brought his cleaning machine, but John and Glen cleaned quite a few nests by hand. We saw very few parasites, resin bees, or other undesirable intruders. One board had some white mold in the center. There may be some cocoons from other local species of Osmia with similar nest construction. However, we are not concerned about them, because they may be good berry pollinators, so they are welcome. Basically, we were quite pleased with the yield of bees. 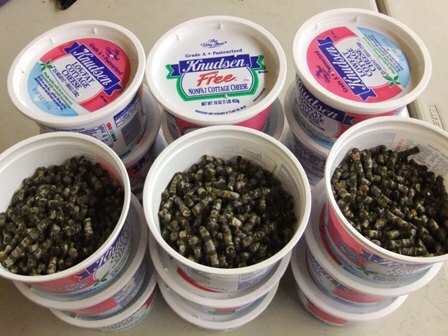 We removed 31 cups of cocoons, with an average of about 700 cocoons per cup, for a total of about 21,700 cocoons for next year! That’s quite impressive considering that the O. aglaia were not able to do much foraging for several weeks at the beginning of the season. 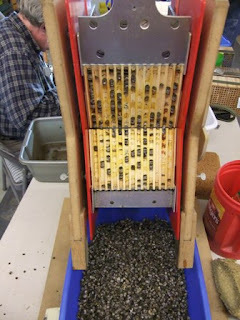 This year we saw a 2.7 fold increase in our bees. We had about 4000 empty tunnels for approximately 4000 females. We might have been able to raise even more cocoons for next year if we had more nests to put out. This spring we are going to need about 10,000 tunnels to accommodate all of the females that we expect from this year’s bee yield. 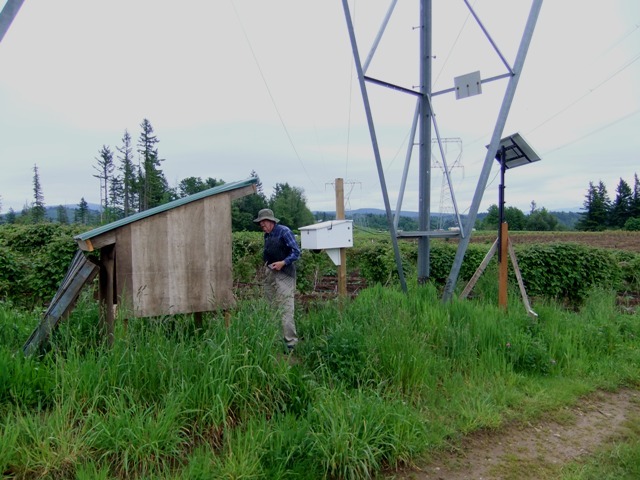 We had an average of 4.6 cocoons per tunnel in the nests close to the webcam and black raspberry patch, and 4.2 cells per tunnel in the nests under the tower in the center of the field, near the marionberry. That’s the good news. The bad news is that pollination on the black raspberry was very poor last spring. O. aglaia activity was too late. 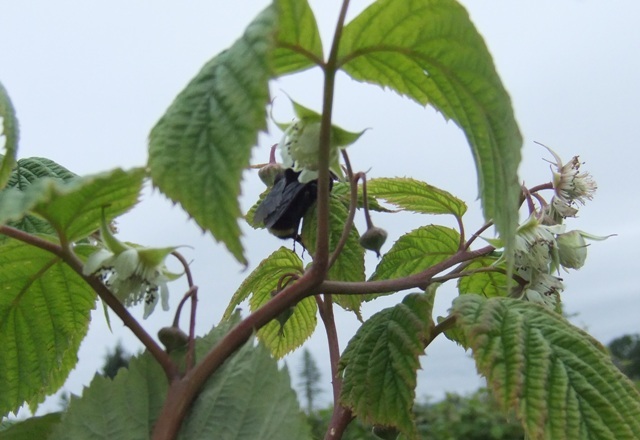 Though I saw bumblebees and honeybees foraging on the black raspberry at the end of May, there apparently wasn’t enough activity from them to do much pollination. 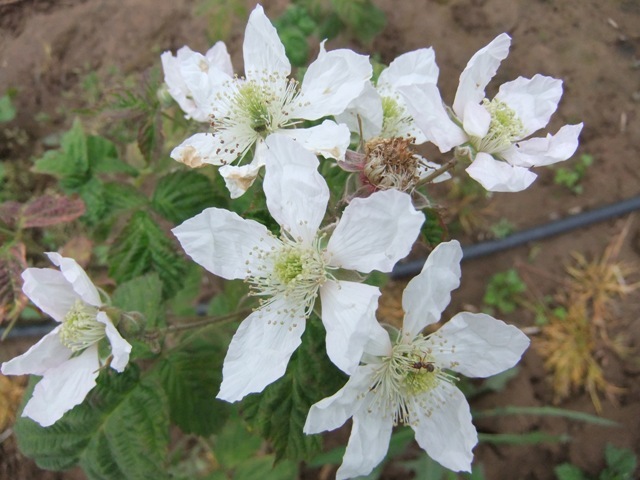 Since black raspberry is the most difficult variety to pollinate, and the main reason that we originally wanted to try O. aglaia, it’s looking like the berry bee is not going to be as useful as we hoped, at least in a year with a cold, wet spring. 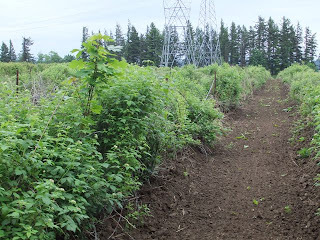 So, we are planning to put O. lignaria in the black raspberry shelter next spring, in hopes that they will emerge early and forage from the early raspberries when the berries come into bloom. O. lignaria should be more active in cool weather. If they prove useful for black raspberry, we should be able to increase their numbers. Meanwhile, we will use O. aglaia to pollinate berry varieties that bloom at the same time and after Himalayan blackberry. 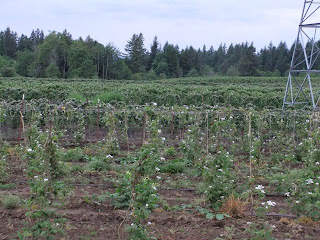 This has been a slow spring for raspberry pollination. It's been raining nearly every day for several weeks, or so we've heard. John and I made our visit to Corbett last Sunday because it was the only day all of last week and this week that rain was not predicted. We hoped for some sun, and got perhaps a hazy hour or two, but most of the day was overcast. Temperatures were in the low to mid 60s during our visit. 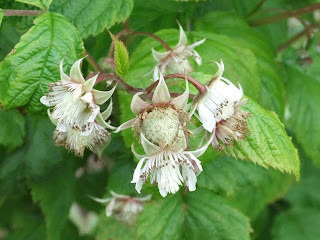 The first photo is of black raspberry flowers. They are not very showy. Petals are small. This inflorescence had 6 flowers on it, more than most inflorescences. The flowers have many stamens wiht brown anther sacs in a circle around a cluster of white pistils in the center. I expect (though I didn't have time to observe) that most honey bees go after nectar from the side rather than from the top. That would limit their ability to move pollen from stamens to stigmas. Yet the flowers are getting pollinated. The flower in the middle is clearly developing a fruit. This inflorescence gives a good indication of where we are in pollination. One flower with a developing fruit, one flower at the top right has lost it's petals and will probably show a developing fruit in a few days, two or three flowers are in full bloom with anthers in various stages of presenting pollen. Here's a view of several rows of black raspberry in bloom. Can you tell it's in bloom? From this distance you can just make out small clusters of flowers in the closest bushes, if you know that they are flowers. Despite the poor weather bumble bees and honey bees were busy foraging all day on Sunday. Rosie commented that the bumble bee population on their farm seems to have been increasing in the last couple of years. There are no honey bee hives on the Sturm farm this year, but honey bees have been coming in from elsewhere. 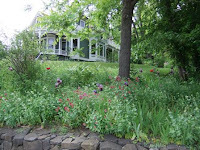 My guess is that the bumble bees and honey bees are responsible for most of the pollination on the farm this year. I saw a few tiny halictids on the berry flowers as well, but they were mostly taking nectar from the side of the flowers, so probably not doing much pollination. The O. aglaia have not been very active as far as I can tell - more on that later. Compare the black raspberry with marion berry flowers. 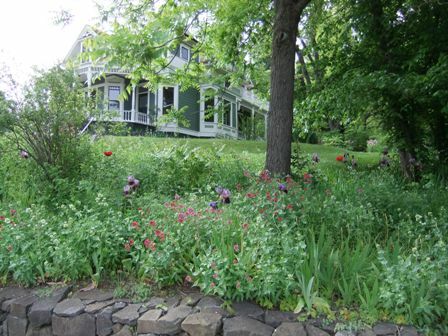 The petals are much larger and showier, and the flowers can be seen from a distance away on the shrubs (photo below). The blackberries bloom a little later than the raspberries, but they are in full bloom now, and getting multiple visits from bumble bees and honey bees. There is even an ant crawling around on the lowest marion berry flower in this close-up. 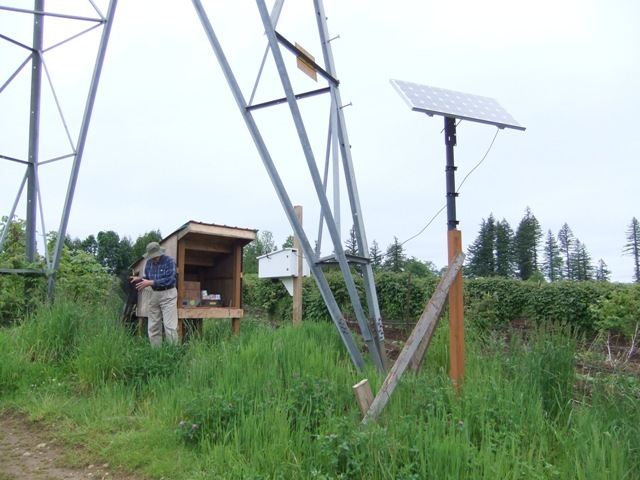 Rosie put out a shelter with more of our Binderboard and O. aglaia next to the marion berries (scroll down to see photo). Something has been getting at the bees - maybe a humingbird? We covered the entrance to try to deter predators. 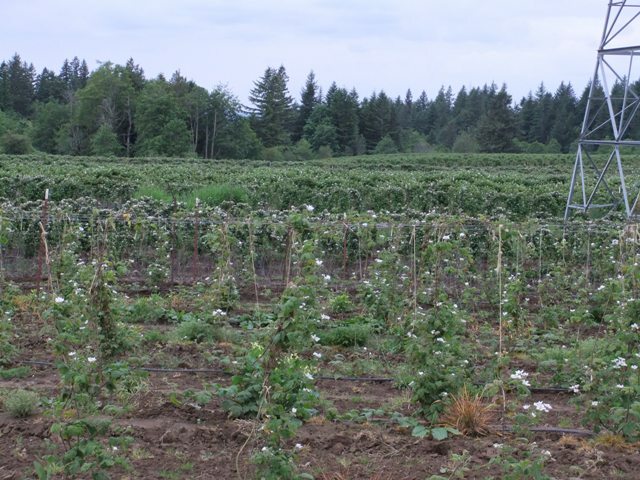 Here are three views of the webcam in situ in the Sturm's raspberry field. 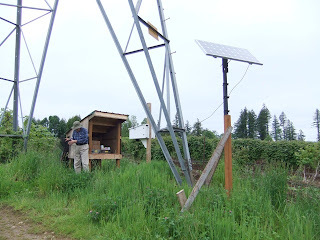 As planned, the shelter, camera and solar panel that powers the battery for the camera are all sitting under a huge powerline tower. The bushes around the shelter are black raspberry. 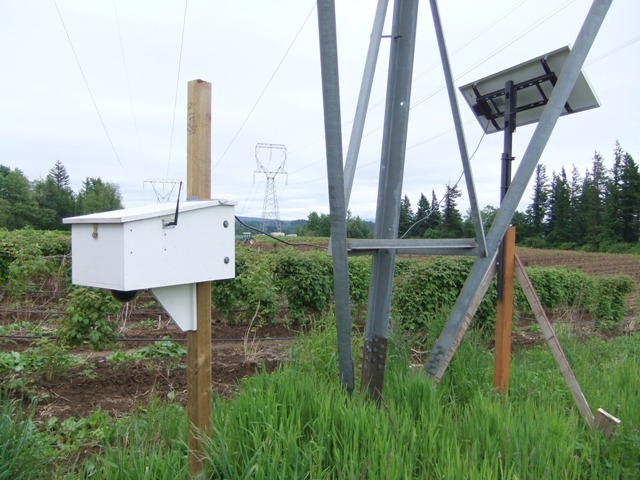 The webcam resides in the white box between the bee shelter on the left (north) and the solar panel on the right (south). The white box provides protection to the camera from the elements. Mike built the box in his shop in Seaside, OR. Great job, Mike! You can see the black dome around the camera poking out underneath the box in the second photo. The camera can move 360 degrees to view all around the area. Most of the time we are interested in viewing the shelter, or the raspberry bushes nearby. Don Sturm built the shelter. This one is quite cozy compared with the old apple crate that we were using last year. There is plenty of room for nests and bees, and lots of protection. We need to be careful that it isn't used by rodents, birds, or larger critters. To help keep out unwanted vertebrates we purchased some screening from the local Home Depot and installed it over the opening to the shelter with pushpins and nails. 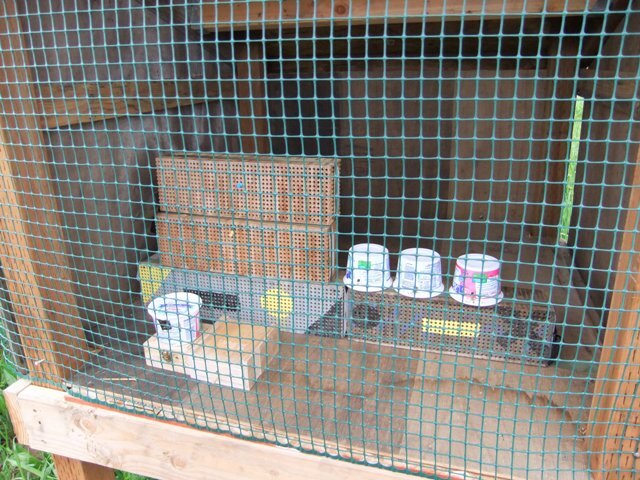 Mice, spiders, wasps, and other small creatures can still get in, but at least hummingbirds and jays will be detered. Hopefully also racoons or possums, though they can probably chew through or pull off the screening if they want in. All the more reason for us to be able to monitor with the webcam! If Rosie wants to get access to the nests or emergence boxes, she can take the mesh off of the nails holding it in place on the left. 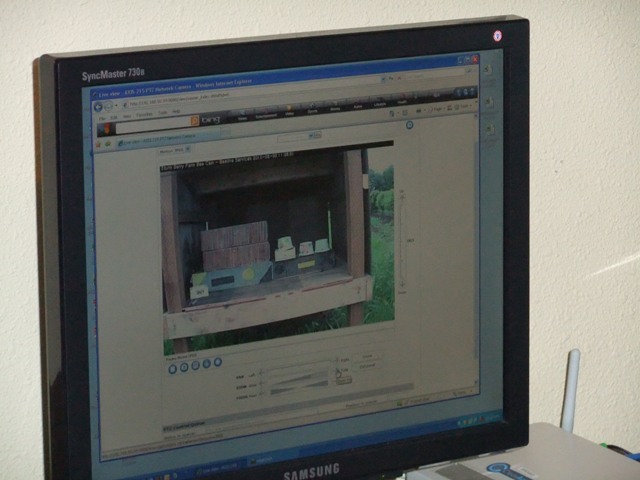 We were playing with the webcam from the Sturm computer on Sunday morning, when all of a sudden, something blurry flew into the shelter. It took us a couple of seconds to realize that it was a hummingbird! OMG, I've never seen a hummingbird at a bee shelter before! Jays and woodpeckers are always a threat, and screening is recommended if bird predation is a problem. But hummingbirds? We hadn't yet figured out that we can capture and save the webcam images, so I tried to photograph the computer screen to document this visit. 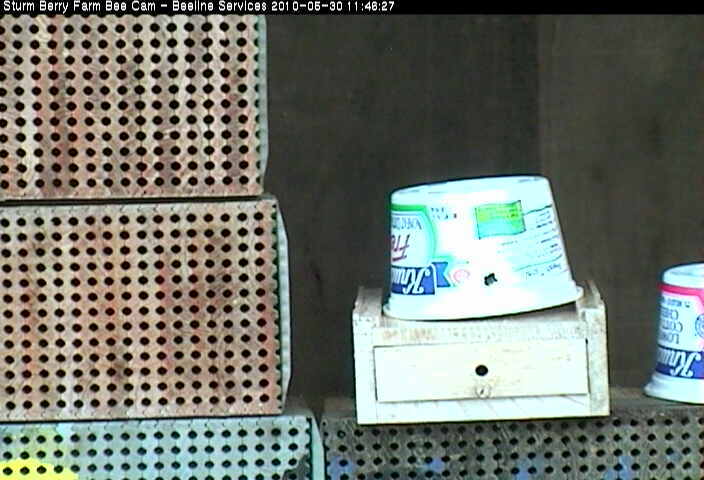 See the blurry light blob just right of the left-most cottage cheese container - emergence box? That's the hummingbird. It was the best that I could do. She didn't stay long. I think this little bird was a female because I didn't see any flashy metallic male colors, although the light may not have been right in the shelter. We watched her stick her long beak into a couple of entrances in the Binderboard, and then into the holes of the emergence boxes. We couldn't tell if she found any bees to snack on, but she certainly could have been eating them. It's also possible that she thought these were hummingbird feeders and she was looking for nectar. We only saw the one visit, never saw her in person at the shelters. 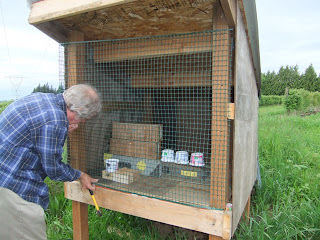 Before leaving the farm we covered the shelter with vinyl mesh to keep the birds out. 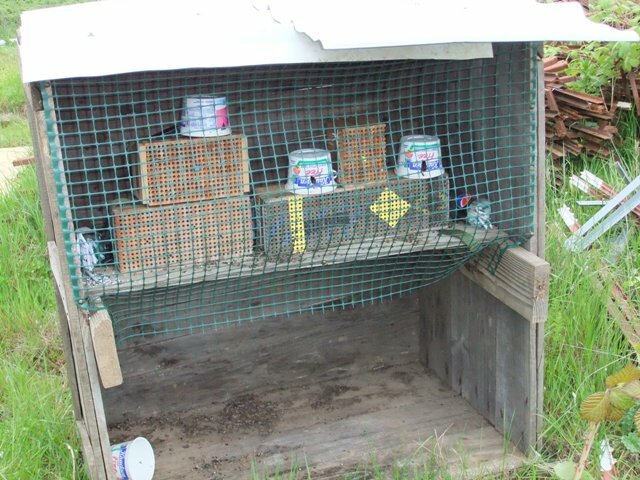 Hopefully it will keep out our little hummingbird and her friends. Sorry hummers, these bees are not for you! Sunday, May 30 we spent the day at the Sturms' Berry farm to see how the bees and flowers are doing. 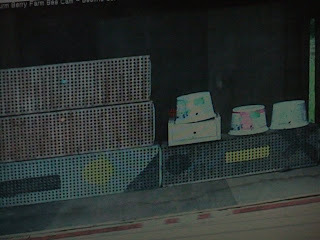 First, Rosie showed us what the webcam images look like on their computer. Here's John in their office, with an image of the raspberry bushes from the webcam. We could see the branches moving in the breeze. The images are great! I gather that the problem resides in the router. 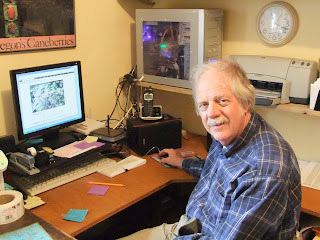 Mike has tried two different routers, one white and one black just to the right of the computer screen. Mike purchased the black router with the silver band around it. The internet provider, rconnects, sent the white route. But neither communicates with any computer except Don's. ARG!!! Any suggestions from our readers? Here's a closer look at the computer monitor with the webcam image, this time showing into the bee shelter. A bit of the raspberries are visible to the right of the bee shelter. Below the image are easy tools to get the camera to pan and zoom in or out, right or left. A scroll bar on the right side of the image will move the camera up and down. 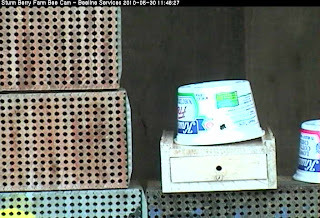 In this image we can see the status of the nests. No plugs yet. There was very little bee activity because it was overcast and chilly. We can zoom in close enough to get a good view of the nest entrances. If any bees had been sitting there waiting for the sun, we would have seen them. The big yellow circle in the top left is a yellow push pin - Steve's idea - to give the bees something to orient to. 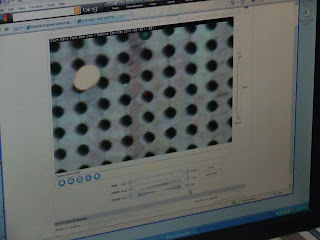 We were able to capture images from the webcam and e-mail them to me. It took a couple of days for them to show up in my in-box. 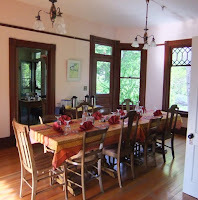 The resolution is not great, but good enough for this blog. Here's one of the images, another close up of bee nests in the shelter. Note that the top of the image has information about when and where the image was captured.